Pledge Support for Cullen’s Scholarship! For the first time on my camino, we walked with the same person all day, of course, it was my Belgian friend, Dirk. At the end of the day, we chose this albergue because the guidebook stated that the nominal donation included a shared meal with the other perigrinos (which I´ve always found most interesting), as well as a “pilgrim´s prayer service.” This proved most disappointing, amounting to passing around a bogus candle and stating whatever comments about the Camino you wanted to share, such as why you were doing it. Most others were in German, the rest in Spanish, and one in Italian. Clearly I learned nothing of the wisdom offered by the others, except one. Peter, who was quite German chose to attempt to speak in broken English, a fact in itself I found a bit interesting. He also did so before me, so it was obviously not for my benefit. His story fascinated me. 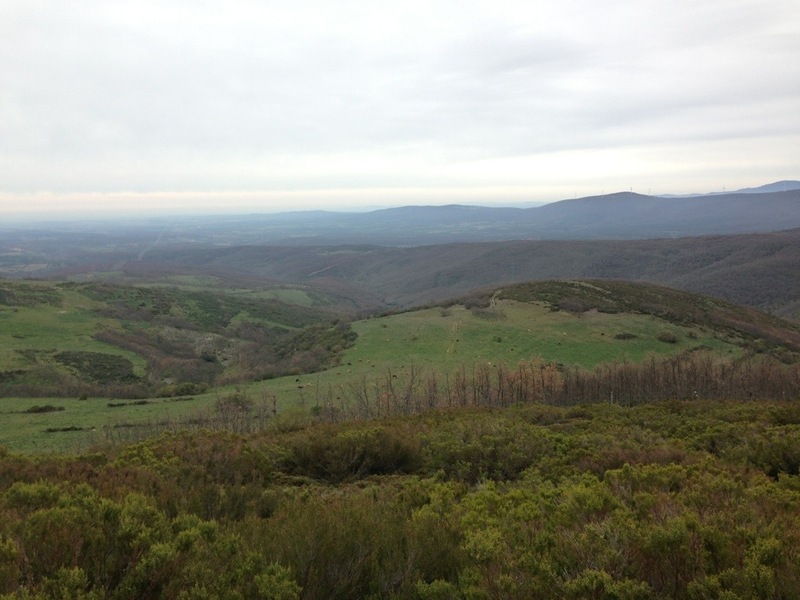 Distinct from pretty much everyone I´ve met (except the handful I´ve mentioned), who seem to be doing the Camino as a kind of a “mid-life reset,” or (believe it or not) because it looks good on a European resume – something about stick-to-it-iveness. So Peter simply said he was walking the Camino to thank Jesus “for saving his life,” then passed the candle. Well, you know me well enough to know that this was the hook to draw me in. So I left my Belgian counterpart, and sat next to Peter during the shared meal. To make a short story long, which I´m inclined to do, Peter was a clinical psychologist in Berlin and came to the mid-life realization that he was just “going through the motions” of living. He felt he did a very good job of guiding people out of their own problems, but in his head and heart and soul, he was lost and felt like he was wasting his life. He served no real purpose. If he wasn´t there helping his patients, someone else would be, so he felt his life was pointless. Peter resigned his partnership in the medical practice, cancelled his appointments, and quit. His wife left him because she wanted the luxury and prestige he would no longer be able to provide. He spiraled towards the bottom, couldn´t get out of bed, gained about 50kg, and contemplated suicide. He was cleaning out drawers and closets, not even knowing why, and came across a small card with the picture of Jesus and the Sacred Heart image. Peter said he had no idea where the card had come from, because he was not Catholic, and neither he nor his (ex? )wife had ever been religious. He´d never even given much notice to religion or other “such stuff.” He remembered vividly of how he was drawn to the image. He felt warmth and comfort that he hadn´t felt for years, perhaps ever. Peter searched on the internet and spoke to people he knew who were religious to find out more about the image, and this Jesus. He started attending Mass and found himself in a much different type of tears – ones of consolation, and love, and salvation. No one seems to know where the Sacred Heart card came from, but Peter credits it for literally and figuratively saving his life. About a month into his “being saved” from himself, a good friend that he hadn´t seen for years stopped by and told him about the Camino. Peter was at a point that he quickly said¨, “Sure, let´s go!” But his friend told him that he´d need to prepare, both physically and spiritually. And he would need to do it alone. 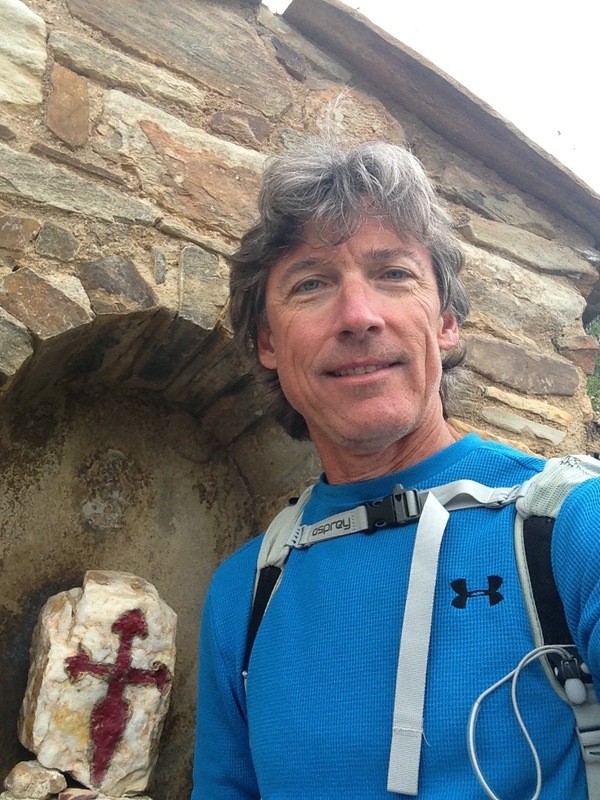 Peter proceeded to walk every day, buy gear, and knew he was becoming spiritually prepared. Apparently there is a problem attaching iPhone pix to a wordpress blog – they don´t seem to be recognized as JPEG files. Still trying to figure out a workaround, These posts would have alot more flavor with some of the magnificant scenery I see everyday. I can post a photo, but not with text – likely because out of country and something to do with data uploads. I´´ll keep trying. 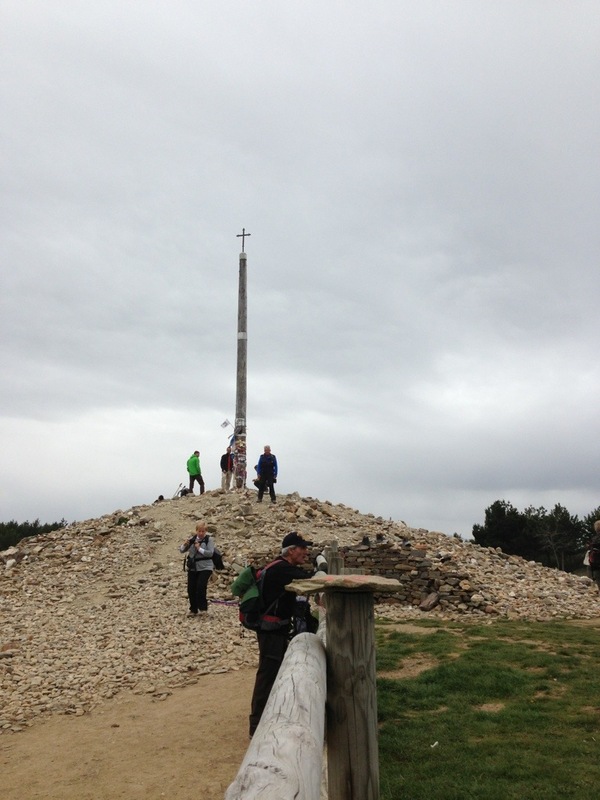 The Camino de Santiago is an assortment of routes that lead to the Cathedral of San-tiago (Spanish for St. James), where St. James the Greater, one of Jesus three closest companions was buried. Along these routings are markers to let the pilgrims (perigrinos) know that they, indeed, are on the right road. Most of the times the markers consist of a small, simple yellow arrow, painted on the street, curb or side of a building. This instills much confidence after hours of hiking that the weary traveler is traveling in the right direction. Outside the cities, towns, and villages the waymarkers are constructed of concrete, small pillars about three feet tall, with the symbol of the camino attached as a ceramic tile to its side. These are strategically placed to greatly aid the perigrino by confraternity volunteers, and are greatly appreciated for the same reason. You come to expect these at regular intervals, every few miles, and start to feel lost and question your path when you havent seen one recently. Its rather easy to daydream, or get lost in thought, contemplation and prayer and miss an indicator which may have indicated a turn, for instance. So with that backdrop, I was walking along alone this morning and happened upon a group of three ladies who were speaking in English. As I closed the distance behind them, I realized they were Irish, speaking with quite a brogue. We introduced ourselves, with the typical small-talk, and they inquired as to whether or not I´d been to Ireland. Well of course these stories of Camille, my oldest daughter being a many time American Irish dance champion, with the resultant trips overseas, including Ireland came out. Soon we were discussing our friends Donica and Sheena (I never can get the Gaelic spelling of their names right, so I won´t even try), who own a B & B in Roosky, in Rosscommon. The lightbulb, of course, then went on. I pointed out that throughout life, our leaders – our parents, elected officials, scout leaders, friends, mentors, and yes even our priests and ministers are in fact “waymarkers.” They serve to guide us, to point the proper direction, to guide the way. The proplem is that all of these “waymarkers” are simply human beings, with all the weaknesses, frailties, and sinful tendencies that all of society, all of us have as humans – it is the “human condition.” Not to belittle the scandals, or any sin for that matter. Most of the waymarkers along the road were in excellent condition, well maintained with fresh “clamshell” icons, and a coat of paint. A few had a few cracks, but were generally in acceptable shape, and served the purpose of guiding us in the correct direction. However more than a few were in dis-repair, crumbling, and a couple in a sad pile of rubble on the ground. And so the metaphor is obvious. Because our waymarkers are also human, they can crumble, like we can, and often do. “Still,” Irish Eileen exclaimed, she´d ¨”not be going back into a church anytime soon.” Fair enough, but perhaps this give us some thoughts to ponder. The fact that our waymarkers crumble doesn´t stop our Camino. The road still leads to Santiago, there will be twists and turns along the road, with the need to have guidance when there is an obstacle. The Church and all it offers, the sacrifice of the Mass, the social gathering strengthening and supporting each other. The fact that the markers sometimes crumble is irrelevant to the goal, the desired endpoint. Of course we expect our leaders to have a higher standard. And when they look at themselves in the mirror, I´m sure many are disappointed in themselves. As I am many times. As we all are, if we´re being honest. Just a quick note, since only 4 minutes is left on my albergue pay per minute computer. I´ve only met three Americans on my camino. Very interesting, but certainly gives much insight as to the rest of the world, and how we are viewed. The truth does emerge after consumption of “a bit” of the local grape harvest. As I´ve mentioned (many times I think, but perhaps oñly in my mind, as I hike for hours), I seem to keep running into the same people, especially those that I click the most with, or have the most in common with. I seldom walk with someone for more than an hour or so, finding I get so much more of a ¨Camino¨with alone time. Sometimes this reunion happens days or more after our first encounter – we end up in the same cafe, market, albergue, or path. Dirk De Man (no kidding) is one of those for me, we´ve ended up in the same albergue more times than not, despite the fact that he walks much, much faster than I do. Anyway on this day we walked together for quite a while. Wé had already shared our ¨stories¨ the reasons we ¨think¨we´re on camino, and today we simply chatted about silly, nothingness topics. As it turns out, although he´s from Belgium, he is almost exactly my age, and we share so many (at least historical) favorite ¨growing up¨bands. Rush, U2, Aerosmith, Marshall Tucker Band, Bob Segar, and Kansas. Hence, as we approached Carrion, Spain the title of today´s silly post – Carry On My Wayward Son quickly developed in my mind as I stumbled down this difficult, rocky road. This truly is a beautiful, incredible place. But it is the real world, and everything doesn´t always go right. And yes, evil people are here also who choose to do bad things. Quick post, because this is the Albergue from hell. Packed in like sardines, no heat, no blankets. Decided just to shower, put in the earplugs, and go right to bed. No laundry, no social, no exploring Boadilla. After returning from shower, I discovered someone had borrowed all the Euro I had remaining in my ¨hidden¨secret money pouch. I was out about 150€, but for some strange reason, they left all my American dollars. (As I mentioned in an earlier post, my memory is horrendous, but that is the jist of the lyrics). Everyone who know me knows I have a hairtrigger temper, and am wound as tight as a drum, especially lately. I don´t know about anyone else, but I face tests every day. When we pray for improvement in a vice, or some other quality we´d like to change, I truly think that prayer is answered with a fresh challenge and the strength and courage to confront it. We can´t pray to quit smoking, for an A on an exam, or to quit our chronic lying, and expect to wake the next day with these “gifts.” We wake with the cigs on the dresser next to us, the books on the desk, ready to study, and fresh opportunities to never again answer something with something that isn´t completely honest. OK, so I´m not perfect. And I was plenty friggin´ticked off. But, at the end of the day, I had been warned to never let your money leave your side, even take it to the shower. And I will. I even laughed at myself, eventually. This was one of those tests. I hate my temper, my impatience, and my forgetfulness. Maybe I´m better? I´m reminded of a story told on a retreat by now deceased Jesuit Fr. John Powell about Florence Chadwick, the first woman to attempt to swim the English Channel. She failed, giving up hope less than 100 meters from shore. When asked by reporters why she pleaded for the rescue boat to bring her up, she offered this insight. Were you too cold? Were you too tired? ¨No,¨she replied, Ït was the fog. I lost all bearing from the heavy mist, became confused, and lost all hope and faith. And so it is with us. Tragedy and overwhelming loss results in such a thick fog that we lose all bearing and have no idea which way is forward, even how to stay afloat. We risk drowning in despair and have no ability to ¨see the shore.¨ It is so important to have an inner compass, something in place enabling us to stay afloat, so that when the fog lifts, which it eventually will, we can take a deep warming breath and head towards the shore again. Many of us walk through life with no faith whatsoever. A catastrophic loss completely destroys an individual with no direction to begin with. Even those who truly believe they have a strong faith, a genuine relationship with their God, face an unpredictable event when their lives are shattered by tragedy. Note: Despite untold sums of these funny looking coins repeatedly deposited into this machine (pay by the minute computer at the hostel), the pictures on my phone continue to be apparently unacceptable files.¨ So, very sorry – but no pix for now, too bad many are simply stunning.